I am a big admirer of artists who produce porcelain. I don’t own any, but I sure love to see examples in museums. Porcelain was first produced in China in the first millennium CE and in Japan in the 17th century, but it was not until the first half of the 18th century that European kilns finally learned how to produce the delicate ceramic ware. Once, when I lived in Chicago, I was in a hotel on Michigan Avenue, and was amazed that the lobby was decorated with vitrines loaded with examples of Caughley porcelain. I immediately knew that English porcelain was my favorite of all the 18th century factories. Porcelain in China is made of kaolin (which is decayed feldspar), powdered feldspar, or decomposed granite. The Meissen firm in Germany was the first European porcelain factory. European porcelain was soft-paste and consisted of clay and powdered glass or frit, fired at a lower temperature than Chinese porcelain. The imitation porcelain was called “china.” Another English version of porcelain was “bone china,” a soft-paste modified with the addition of calcined bone. The only criterion for porcelain in Europe was that it be translucent. The Chelsea Porcelain Manufactory was the first porcelain factory in England, founded around 1743 by Nicholas Sprimont, who ironically, was a silversmith. While the company produced all manner of tableware, they were most renowned for figures. In 1769 the firm was purchased by the Derby Porcelain Company, and until 1784 was known as Chelsea-Derbyware. Between the 1740s and 1760, Chelsea wares were based heavily on Meissen designs. Among the most popular of these early designs were animal- and nature-based vessels such as goat-form cream pitchers, conch shell salt cellars, and animal-form tureens. 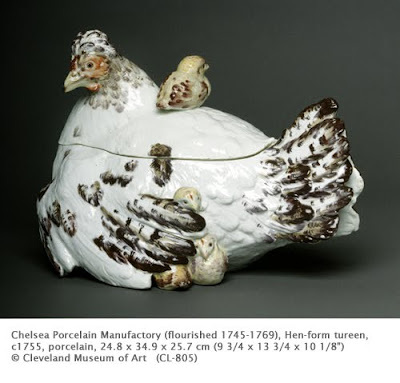 While porcelain vessels such as soup tureens were clearly intended for upper class use, the design of these vessels in such common barnyard shapes as a hen and chicks reflects the Bourgeois Baroque style of the mid-18th century, seen in painting in the work of such artists as Chardin. Soup tureens first emerged as important pieces of tableware during the late 17th century in the French court. This period was the transition from the Renaissance practice of loading a table with all the dishes needed for a meal, to individual settings for each course. Soup was the first course for peasant and noble alike, and in upper class homes, fancy tureens ceremoniously opened the meal. The Museum of London has many examples of Chelsea wares. I love this hen! Is it just me?? I used to be a potter and worked with porcelain. It never got old that smooth, beautiful clay spinning around my fingers.